Steady light rain this evening. Showers continuing overnight. Thunder possible. Low 58F. Winds SSW at 5 to 10 mph. Chance of rain 70%.. Steady light rain this evening. Showers continuing overnight. Thunder possible. Low 58F. Winds SSW at 5 to 10 mph. Chance of rain 70%. 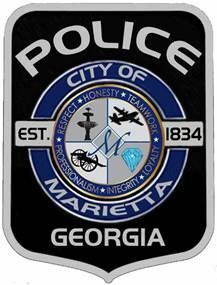 Marietta Police are investigating a crash on Atlanta Street at the intersection of Old Clay Street that left a motorcyclist dead Friday evening. According to investigators, 52-year-old Eddie Ross of Marietta was driving a 2010 Kawasaki ZX1400 north on Atlanta street shortly after 6 p.m. At the same time, a 2011 Infiniti G37 driven by 40-year-old Imari Stewart of Marietta was stopped at the stop sign on Old Clay Street, preparing to turn left onto Atlanta Street. Police said Stewart turned left onto Atlanta Street, entering Ross’ path. The motorcycle struck the side of the Infinity, and Ross was killed at the scene. Stewart was transported to Kennestone Hospital with non-life threatening injuries. The Marietta Police Department’s traffic unit is still actively investigating the collision. Speed is believed to be a contributing factor on behalf of the motorcycle, the department said in a statement. Anyone with information regarding this crash is urged to contact Officer Henry at 770-794-5364.